After years of test launches under NASA's watchful eye, Elon Musk's rocket company SpaceX finally got clearance to launch astronauts to the International Space Station. Only one other company — Boeing — has NASA's permission to do so. "It's really exciting to see SpaceX and Boeing with hardware in flow for their first crew rotation missions," Kathy Lueders, manager of NASA's Commercial Crew Program, said in a statement. "It is important to have at least two healthy and robust capabilities from U.S. companies to deliver crew and critical scientific experiments from American soil to the space station throughout its lifespan." NASA handed SpaceX its first crewed mission order on Friday, clearing the path for the California-based company to regularly ferry astronauts to and from space. In spite of an explosive launch failure over the summer, it has been an unusually good year for SpaceX. NASA's announcement comes about a month after the company secured two big contracts to launch communications satellites sometime in 2017 or 2018. Musk is also vying for part of the US military's $70 billion spy satellite industry — and SpaceX is currently the only company in the running. 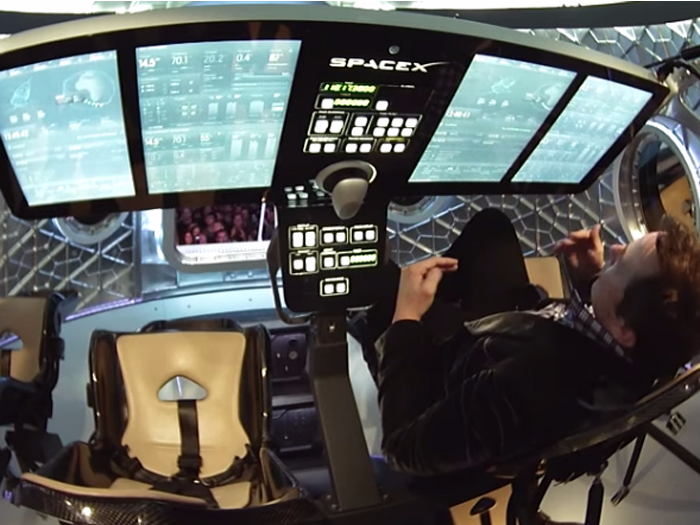 SpaceX will use its Crew Dragon spacecraft to ferry up to seven astronauts per launch. Boeing, meanwhile, is polishing up its CST-100 Starliner spacecraft. Though Boeing was the first private company to receive a mission order with its CST-100 Starliner back in May, NASA's determination of whether to send astronauts up in the Starliner or Dragon first has not yet been decided. The first private company-led mission to launch astronauts to the space station is being planned for 2017.